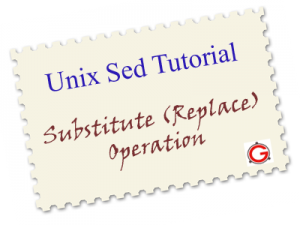 This article is part of on-going Unix Sed Tutorial series. In previous articles, we discussed about sed print operation and sed delete operation. In this article let us review how to use sed substitute command “s”. The `s’ command is probably the most important in `sed’ and has a lot of different options. The `s’ command attempts to match the pattern space against the supplied REGEXP; if the match is successful, then that portion of the pattern space which was matched is replaced with REPLACEMENT. n Could be any number,replace nth instance of the REGEXP with REPLACEMENT. p If substitution was made, then prints the new pattern space. i match REGEXP in a case-insensitive manner. w file If substitution was made, write out the result to the given file. 1. Linux Sysadmin, Linux Scripting etc. 6. Windows- Sysadmin, reboot etc. Let us review some interesting examples for substitution now. In the example below, in the output line “1. Linux-Unix Sysadmin, Linux Scripting etc” only first Linux is replaced by Linux-Unix. If no flags are specified the first match of line is replaced. 1. Linux-Unix Sysadmin, Linux Scripting etc. The below sed command replaces all occurrences of Linux to Linux-Unix using global substitution flag “g”. 1. Linux-Unix Sysadmin, Linux-Unix Scripting etc. In the example below, in the output line “1. Linux Sysadmin, Linux-Unix Scripting etc.” only 2nd occurance of Linux is replaced by Linux-Unix. 1. Linux Sysadmin, Linux-Unix Scripting etc. The example below has substitution with three flags. It substitutes all the occurance of Linux to Linux-Unix and prints the substituted output as well as written the same to the given the file. In this example, if the line matches with the pattern “-“, then it replaces all the characters from “-” with the empty. This sed example deletes last 3 characters from each line. Delete all the comment lines from a file as shown below using sed command. Second command deletes the empty lines. Copy the DOS file to Unix, you could find \r\n in the end of each line. This example converts the DOS file format to Unix file format using sed command. In this example, the regular expression given in the sed command matches the html tags and replaces with the empty. This <b> is </b> an <i>example</i>. How would one rearrange the columns output by ls -al? I am getting so much benefit from these articles. Thank you! Have you had any luck with making “Printer Friendly” versions of these pages? I would love to be able to print them out and write down my own notes on them. I could not come up with the correct version myself. Can you help? Its for removing simple html tags. sorry you are right Jimi. Print Friendly option is implemented. You’ll see this at the bottom of all articles. Thanks. Hmmm… works on Ubuntu, though the filenames need padding, but has no effect on AIX. Excellent! Followed all articles, all are well presented. Can i use two or more find and replace at a time using sed. I am trying to write a script. In /var/log/messages i have to delete lines older than 5days when compared to the present date. Could you people help me out in this script. I type vi thegeekstuff.txt , it appears that the old file remains. Thus, do i still need to type in anything to save the changes in thegeekstuff.txt ?? Also want to thank the blogger for this site and its edifying content. This is a very useful tutorial. I’m actually facing a problem with the pattern search, and haven’t been able to figure it out. I have a file I need to load to a database, and for that I need to insert a special character when I find the following sequence of characters: double quotes – end of line – double quotes (“\n”). I need to insert a @ symbol between the first double quotes and the end-of-line (“@\n”). The \n is of course the end-of-line character. So far I’m only been able to insert the character using: (“$), sed ‘s/\”$/&@/g’ filename, but sometimes I need to make sure the next line starts with the double quotes character (“). Is there any way to do it with SED pattern matching? I have tried with different combinations, but without any luck. Thanks in advance, great blog by the way. sed works line by line. There is no sed option that I know of to do what you are looking for. Hello. I saw how I can replace a word’s first occurence in each line. But my question is: how can I replace a word only if it is the very first one in a line? Anonymous, the dollar sign means the end of a line and the carret means the beginning. I have an xml file with some properties and I want to replace a value based on the value from other tag. I tried with perl and its working. But I want to do it with ‘sed’. please help. In the above example, I want to change the value of valueB to user input data based on nameB. The hint is “nameB” is default and will not change. But the valueB can be different even before user input. So, the sed command should find “nameB” property and then modify tag for it. I have file like this and there are many occurances of same parameters. Now i want to change that 1 to 15, but i just cannot find for DELAY_TIME and replace because DELAY_TIME occurs many times. Is there a way i can get this done? I need to strip it a bit. Sorry i missed to specify at end of line. I need to change BART that is in every .sh module in a directory to CART. Would the following work? In the first example, on the 4th line it should be “4. Storage in Linux” and not “4. Storage in Linux-Unix” ? I need replace the CR which appears in the middle of the data with a space ‘ ‘, but the last CR of each line no. This command echo `sed -e ‘s/$/\ |\ /g’ file.txt` replaces all CR with a space, but I dont know what else I have to aggregate for respect the last CR of each line. in first example ur output in 4th line is linux-unix. how about wan to add word infront? what do PATTERNs and ADDRESs stand for in first example? Very helpful tutorials. I love it. Looks like a typo in example 1. Not only it replaces the 1st match on line 1 but also again on line 4. Should not be just only 1 replacement (on 1st match)? The last point u have mentioned is quite interesting. If suppose i want to remove “” tag for the prepositions like is,are, for, like that so how to do that using sed. Shrey is correct; in addition to the substitution on line 1, there is an extra “Linux” -> “Linux-Unix” substitution on line 4 of example 1. IT should only replace the first occurrence on line 1, not the occurrence on line 4.
what to do when the file,the word to be searched in this file and that to be subsituted with in this file is taken from user within the script??? #9 looks wrong. “$sed ‘s/\r\n$/\n/’ filename” should be the safe alternative that doesn’t convert to Mac linebreaks. what am I missing. Your help would be greatly appreciated. am trying to delete all empty lines starting from a particular line number. but its not working as expected. Can anyone help me out. The ‘d’ is part of the expression and must be inside the tick marks. Also you apparently can’t use both address (3,$) and match (/^$/) together. I modified the author’s example to search for and remove whitespace (\s) before deleting the line.